The Global Uncertainties School Network has now completed its programme of events held in conjunction with six schools and colleges from around the country. 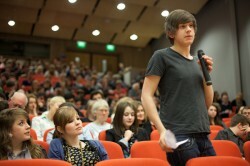 The final event, held at Blackburn College on 30 April, was the exciting culmination of a fast-moving and unique project. The Global Uncertainties School network has been an exciting project for the Debating Matters team. Supported by Research Council UK’s Global Uncertainties Programme, the project has drawn on the excellent work of some of the Programmes’ fellows, who have not only contributed to the network’s resources but have also taken part as speakers and offered insightful and thoughtful reflections on the wide-ranging themes of the programme. In addition to Global Uncertainties fellows who took part at each of these events, the school network has benefited from the input of a diverse and impressive range of contributors, whose input as speakers and judges have benefited students enormously – Debating Matters would like to offer all of them our heartfelt thanks for helping to make all 12 of these events such a success. The Debating Matters team would like to acknowledge the hard work and commitment of all of the teachers and schools who generously hosted the Global Uncertainties School events and to thank them for all of the work that went on behind the scenes to make these events happen- David Perks at Graveney School in Tooting, Owen Tiplady at Redland Green School in Bristol, Paul Moore-Bridger at Silverdale School in Sheffield, Kevin Rooney at Queens’ School in Bushey, Richard Swan at Harvey Grammar School in Folkestone and David Jones at Blackburn College. Finally, we would like to thank RCUK’s Global Uncertainties Programme for their partnership in this project, and for helping us to create unique events for schools across the country.